Probably the best selling model range in Quintrex’s vast portfolio is the Renegade. These are boats for the fishing purist and built with an eye on holding down price: buy a standard Renegade and it will have no paint on it. The reviewed Renegade 460 is in the middle of the size range. Ours had the side console option, tiller steer and centre console being the other choices. It had also opted for paint and a decorative vinyl wrap. Vinyl is not a gimmick material: many east coast ferries wrap their hulls with it for ease of repair as well as a lively appearance. Quintrexes are less easy to recognise since the advent of the so-called Blade hull a year or so ago: the familiar clinker-look topside has disappeared. Hull shape changes are slightly less obvious but probably more significant. The key change was to make the forefoot deeper and much sharper, increasing the deadrise generally. Quintrexes have a long held reputation for delivering a good ride, and the Blade hulls I have previously driven had improved on it. The review day produced the sort of conditions to test the hull realistically: a short, steep sea of no great height but capable of loosening fillings if taken at speed in an indifferent boat. The Renegade behaved itself as though trained: the ride was well above average for a boat of its size, and the controllability was exceptional. With wind and sea from any angle steering was literally hands off for big chunks of time. For its hull length of 4.65 metres the Renegade has a lot of volume. The generous beam of 2.22 metres obviously contributes to this, but maintaining the beam well forward adds its share. The available deck room constitutes the whole of the 460’s footprint minus the small console, so the five people the rating allows would not be crowded. And they would inhabit a boat with reassuring stability. 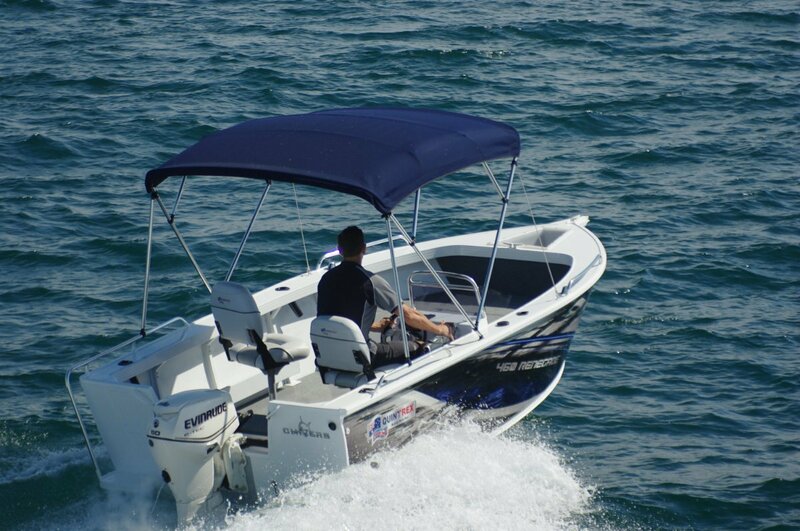 Stability is welcome in a boat with casting platforms at both ends, platforms with extra roles as storage places, casual seating and as plain deck. The official seating is provided by a pair of swivels with a choice of three sockets. All the socket positions are shaded by the large canopy, whose supports are tough enough to cope with its considerable windage. 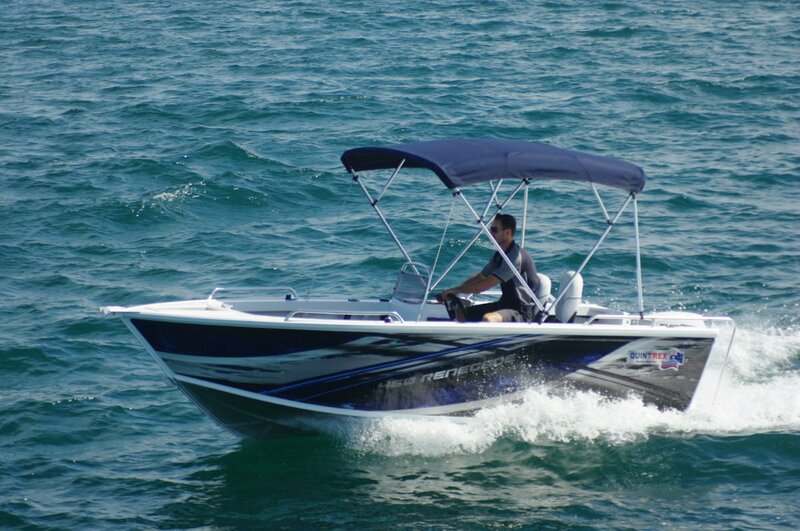 The miniscule windscreen, just ornamental really, does nothing to the wind aimed at the driver, but in this style of boat who cares? Spray was not a problem; the Renegade did not create any. Though practically nothing intrudes into the fishing space, the Renegade has no shortage of places to stow things. The console is too small for anything more than feet, but under the forward platform is room for a couple of loaded kit bags plus smaller items. The after platform concentrates on housing a live bait tank, a tackle tray and the batteries; linking the platforms are full length side pockets. The specialised stowage item, the anchor well, is a plastic bin recessed into the small foredeck. This choice of material eliminates the maddening clank of chain and anchor. The 460 is a solid vessel. Adding to the stiffness Quintrex’s stretch forming creates is thicker aluminium than usual in this size of pressed boat: 3mm on bottom and sides. It’s quiet too. The stiffness of the bottom plus the insulation provided by the foam flotation, the plywood deck and the carpet does the trick. The 60hp E-TEC, a far from raucous motor, played its part too. Paint, wrap and a few items like drink holders pushed the review boat’s price up to $29,990, but the standard, naked boat on an aluminium trailer is $27,100. That is one of the lower priced 15 footers capable of fishing the likes of Five Fathom Bank.